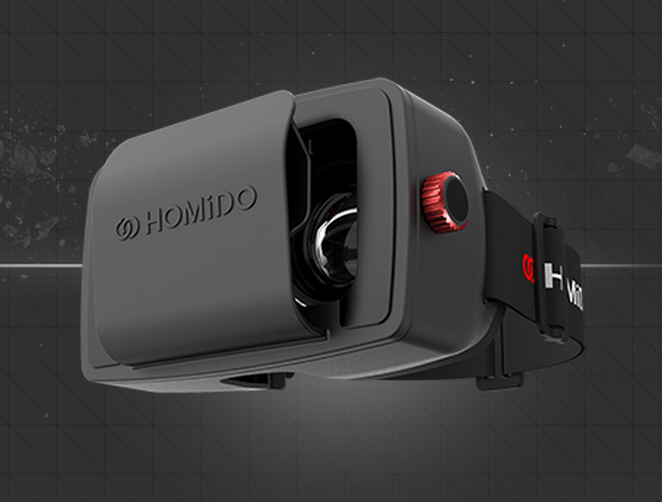 The Homido VR smartphone adapter is available for pre-order today for €69. The device, which mounts a smartphone into a head-mounted housing for use as a VR headset, will be delivered in October, according to the France-based company. Homido says their VR smartphone adapter is compatible with some 80 smartphones, including all Apple iOS smartphones since the iPhone 4. The headset comes with a pair of lenses and 3 pairs of silicon lens holders, a strap, and a solid looking zip-case to store the unit. While the VR smartphone adapter joins the competition of several similar devices, the company is also releasing a sleek Homido app that goes above and beyond what we’ve seen in terms of side-by-side video playback that’s specifically designed for such devices. The user-experience is quite impressive as the app can be browsed like usual in portrait mode, but any part of it can be instantly converted into a side-by-side format by switching to landscape mode. 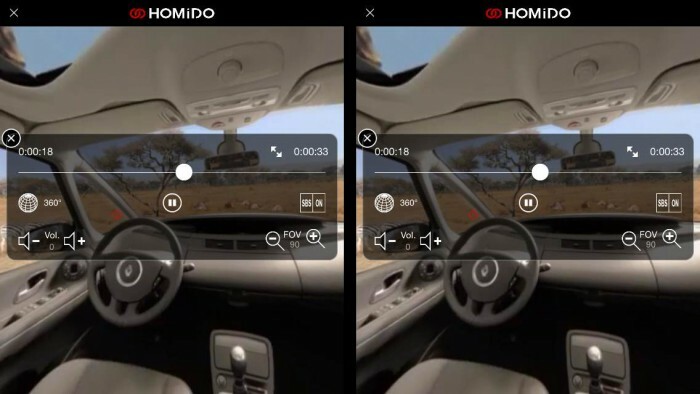 The Homido app is a video player and web browser that presents content in a side-by-side view that’s compatible with Homido’s own VR smartphone adapter, and any such device like Google Cardboard, Durovis Dive, and others. The Homdio app can handle local and streamed content in 360 degree, cylindrical, 3D, and 2D projections. The ability to toggle between projection types and side-by-side display makes it compatible with a wide variety of content. 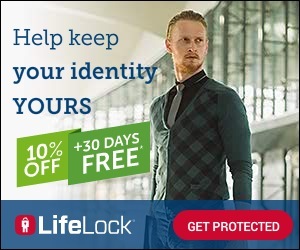 The app also includes a web browser which can be used to navigate to any mobile-streamable video, including YouTube, or used for viewing web pages. Currently there’s not any effective means of interacting with the page while wearing the headset, but the functionality is there, and could offer an interesting experience if paired with the right bluetooth controller (or possibly a bluetooth mouse and keyboard, in the case of Android). The Homido app features an ‘Easy-Nav’ system which lets you bring up a head-tracked cursor. Hovering the cursor over buttons in the app for a moment makes a selection, like playing or pausing a video. Control of the app isn’t perfect yet, but this at least allows hands-free operation to an extent. The experience still lacks per-headset lens distortion (as all VR smartphone adapters don’t use the same lenses), but there are adjustments that can be made in the settings page to optimize the experience: Side gap, Vertical offset, and Screen size. Going forward it would be great to see a simple ‘select your VR smartphone adapter’ menu that would automatically select the best settings. IMG_6083I tested the Homido app with and iPhone 5c (as the Android version of the app is not yet available) using Google Cardboard and found a better user-experience than similar apps I’ve used in the past. It’s very easy to browse to the desired content and configure the projection options, especially considering that you can stream any video right out of the web browser. The experience once placed into the VR smartphone adapter was also generally good, though it’s hard to make a definitive statement about the performance when the adapter I have on hand is not technically compatible with the iPhone. Soon I’ll hopefully have my hands on the Homido VR headset adapter itself and will be able to give a detailed review of the app. I’m particularly interested to see if the Android version of the app will work with a bluetooth keyboard and mouse for web browsing. What I can say is that videos played back smoothly on the iPhone 5c and the headtracking on 360 degree and cylindrical videos had fairly low latency, but doesn’t compare to what we’ve seen from full-fledged VR headsets like the Oculus Rift and Sony’s Morpheus. This is likely due to limitations of the smartphone sensors rather than the app, and hopefully we’ll see performance improve as smartphone sensors begin to be tuned for virtual reality use. For now, the Homido app is an impressive foundation for making it easy to view virtual reality video content through VR smartphone adapters, and I’m looking forward to seeing it evolve as the mobile industry starts to catch on to VR. The Homido app is currently available for iOS in Apple’s App Store for $1.99 and Homido says it’s coming soon to Android through the Google Play store. Homido Center is a catalogue of all the compatible apps available for Homido virtual reality headset.